This is a newly reported wildfire. 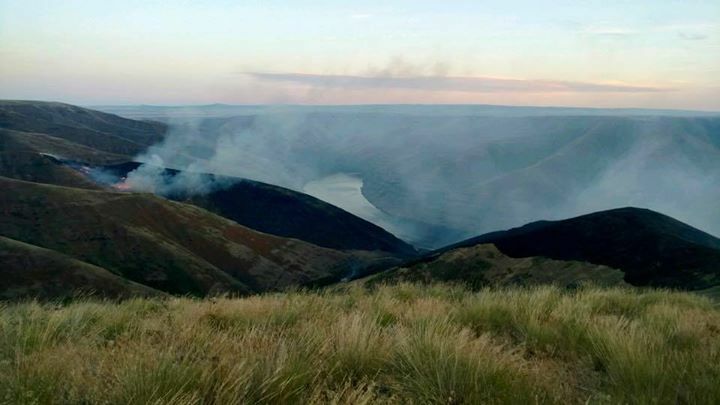 A fire is burning on the Snake River, about 11 miles northwest of Clarkston (Whitman County), Washington that began on July 4, 2018, named the NISQUALLY JOHN FIRE from an unknown investigation. The fire has burned up 1,350 acres of grass and brush. Containment is at 80-percent. There are currently 124 fire personnel (including from Whitman County Fire District 14 and Spokane County Fire District 8) along with four crews and eight engines. The Incident Command Post or ICP is located at the Colton School. Fire behavior has been reduced to minimal activity and smoldering. About 12 structures are still under threat.